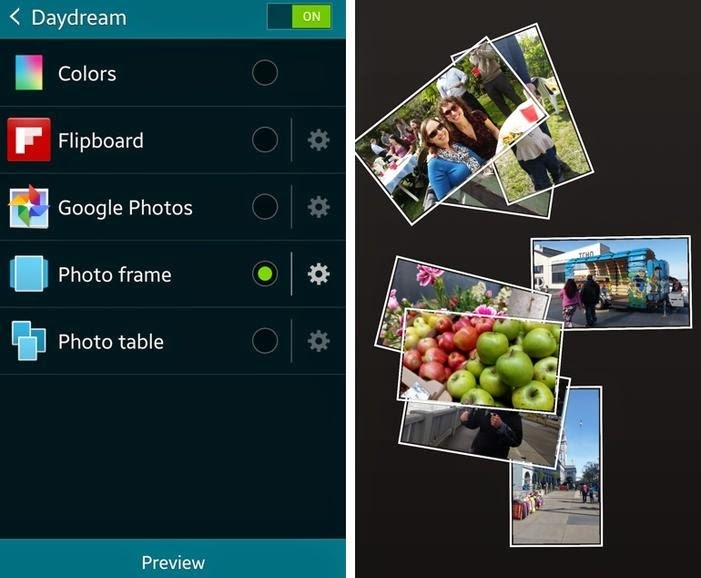 What is the Daydream feature and how to use it on the new Samsung Galaxy S5? Android DayDream feature on Samsung Galaxy S5 refers to an interactive screensaver mode that will automatically activate when the device is charging or docked. By nature, it keeps your screen ON and allows the device to get real-time information. 3. Touch to Display next. 4. Touch to select DayDream. 5. Touch the OFF slider to turn DayDream ON or enabled. Otherwise, leave it ON. 6. Select Colors, Flipboard, Google Photos, Photo frame or Photo table (according to your preference). 7. Touch the Settings (wheel icon) to configure the selected item. 8. To preview your selection, simply touch Preview. You can also customized and/or add more apps to DayDream via Google PlayStore. Just get to the PlayStore by touching on Apps, select PlayStore and then search for DayDream.